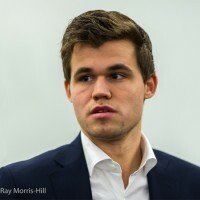 After beating Maxime Vachier-Lagrave in a rapid playoff, Magnus Carlsen won the seventh London Chess Classic and the inaugural Grand Chess Tour. A long day at the office it was, in Kensington Olympia, London. 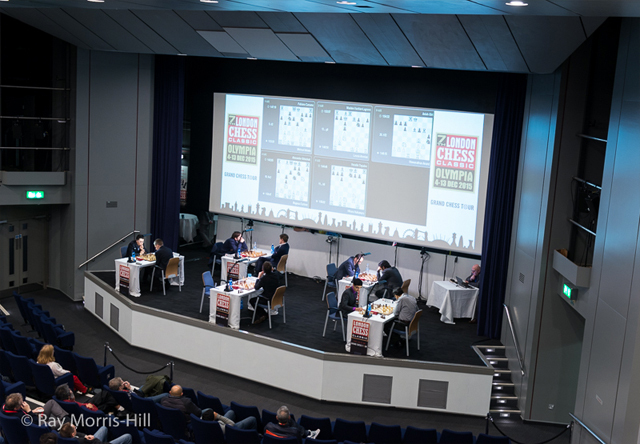 The London Chess Classic, and with it the first Grand Chess Tour, came to an end on Sunday night at 11:38 p.m. local time. The reason was that the tournament ended in a three-way tie between Magnus Carlsen, Anish Giri and Maxime Vachier-Lagrave, and the regulations had stipulated a rapid playoff. And so, 9.5 hours after the chess started, it was the world number one who emerged as the winner. With Gary Lineker in mind, chess can be described as a game between two players and 32 pieces, and in the end Magnus Carlsen wins. The world champion came from behind (he was trailing from the very first round in Norway Chess, which he lost), but won in the end. It all started with a round like almost any other. There was one win and four draws — where have we heard that before? 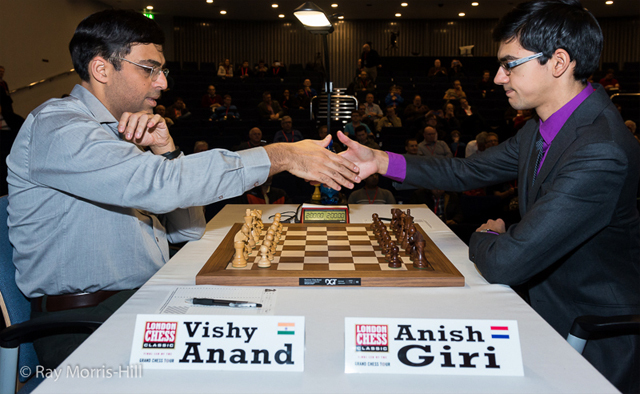 The first game to finish was between co-leader of the tournament Anish Giri and ex-world champion Viswanathan Anand. 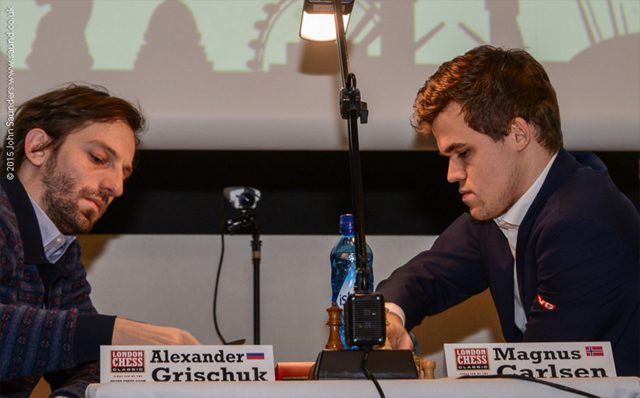 The two played no less than 26 theoretical moves in a Berlin, one of 13 Berlins in total in the classical games. Thirteen of the 45 games were a Berlin in London. | Ray Morris-Hill. Giri had done his homework. He first deviated from a game where he was White (Giri-Radjabov, Tashkent 2014) and then from a game Carlsen-Anand from the Sochi 2014 title match. A few accurate moves were enough to reach a drawn position where “White is only playing for a moral victory,” as Anand said. Anand: “White is only playing for a moral victory.” | Ray Morris-Hill. And so Giri didn't lose a single game in all three tournaments: Norway Chess, the Sinquefield Cup and the London Chess Classic. 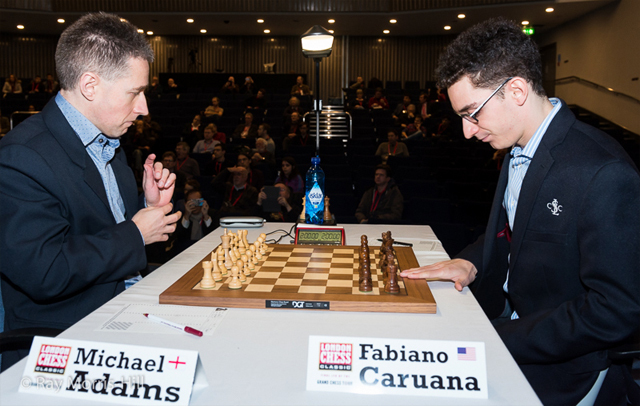 And indeed, not long after that Adams and Caruana did finish their last game with a draw. In a Ruy Lopez with ...Bc5 (Caruana had told Chess.com earlier that he had “kind of grown tired” of Berlins), Black seemed fine from the very start. The two gentlemen who both played nine draws. | Ray Morris-Hill. The next game to finish was Levon Aronian vs Maxime Vachier-Lagrave. Aronian really had to win this one to reach shared first, but he was actually worse out of the opening. MVL could have won the tournament outright (and with it the Grand Chess Tour!) but he never had any serious winning chances either. Another Berlin in Nakamura-Topalov. | Ray Morris-Hill. The game between Hikaru Nakamura and Veselin Topalov was just for the books, and didn't get much attention from the commentators. The fact that it was another Berlin didn't help either. This time it was Topalov who employed it, but his preparation won't have helped much because Nakamura went for the rare 9.Rd1+ and 10.b3. At some point he got his kingside pawns moving, but Topalov found the right setup. By this point Giri and Vachier-Lagrave had reached the playoff, and the question was whether Carlsen would join them. The world champion had a promising position, so most of the experts (including Garry Kasparov, who visited the tournament for a few hours) expected him to win. The game was exciting from the start as Grischuk repeated Topalov's 7...g5!? in the Moscow Sicilian — you might remember him beating Carlsen in the first round of the Sinquefield Cup in that line. Grischuk took up the gauntlet with 7...g5. | Photo John Saunders. Carlsen improved upon his play with 10.Nc3, a more natural square than putting it on a3 as he had done in St. Louis. Grischuk then spent almost 17 minutes trying to remember his preparation. Time trouble seemed inevitable for the Russian, but somehow he managed to avoid it this time. More surprisingly, with about six minutes on the clock (“Oceans of time!” — GM Julian Hodgson) Grischuk missed a good winning chance, and then also missed the route to a draw. “He proved better in this game. In the end he outcalculated me,” Grischuk admitted. 1. Nf3 c5 2. e4 d6 3. Bb5+ Nd7 4. O-O a6 5. Bd3 Ngf6 6. Re1 b5 7. c4 g5!? Grischuk repeats Topalov's remarkable move. The Bulgarian defeated Carlsen with it in the first round of the Sinquefield Cup (as he had done in the first round of Norway Chess). 8. Nxg5 Ne5 9. Be2 bxc4 10. Nc3 (Deviating from 10. Na3 Rg8 11. Nxc4 Nxc4 12. d4 Nb6 13. Bh5 Nxh5 14. Qxh5 Rg7 15. Nxh7 Qd7 16. dxc5 dxc5 Carlsen,M (2853)-Topalov,V (2816) Saint Louis 2015 )10... Rb8 11. Rf1!? A remarkable move. Not only Nimzowitsch would call it mysterious! This meant a three-way tie for first place among Carlsen, Giri and Vachier-Lagrave — in that order. Thanks to his win over Grischuk, Carlsen finished with the most Sonneborn-Berger points (the first two tiebreaks were all equal). According to the Grand Chess Tour regulations this meant that Carlsen basically had secured himself a direct spot in the playoff final. 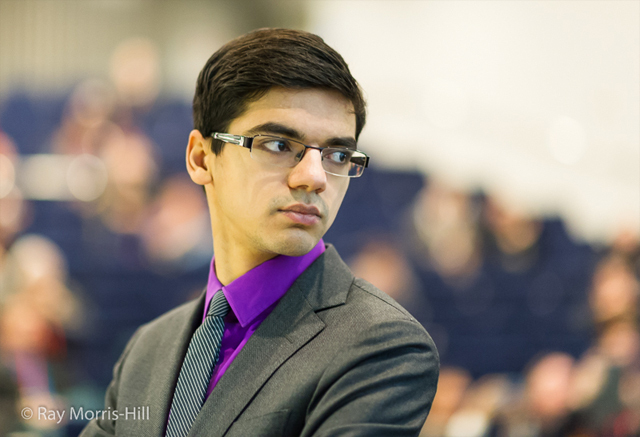 The semifinal started with Giri playing another Berlin against Vachier-Lagrave. And whereas the opening is usually a way of being solid as Black, it can certainly be one to play for a win as well. It turned into a strong weapon for the Dutchman as soon as MVL played an inaccurate knight move. Black freed himself and was left with a very strong bishop against white's knight. Still, White would have be doing OK if it hadn't been for a brilliant tactic that won a pawn for Black. 1. e4 e5 2. Nf3 Nc6 3. Bb5 Nf6 4. O-O Nxe4 5. d4 Nd6 6. Bxc6 dxc6 7. dxe5 Nf5 8. Qxd8+ Kxd8 9. h3 Ke8 10. Nc3 h5 11. Ne2 b6 (11... Be7 12. Bg5 Be6 13. Nf4 Bd5 14. Nxd5 cxd5 15. Rad1 c6 16. Rfe1 h4 17. Rd3 Rh5 Adams,M (2744)-Aronian, L (2781) Reykjavik 2015 )12. Rd1 (12. Bg5 c5 13. Nc3 Bb7 14. Rad1 Bxf3 15. gxf3 c6 16. Ne4 Be7 17. f4 Bxg5 18. fxg5 Ke7 was played in the third round of the main tournament: Grischuk,A (2750)-Giri,A (2778) London ENG 2015 )12... Be7 13. Bg5 Bb7 14. Bxe7 Kxe7 15. Ned4 (Not better than 15. Nf4 c5 16. Ng5 Rh6 17. c3 f6 18. exf6+ Kxf6 19. Nfe6 Re8 20. Rd7 Rxe6 21. Nxe6 Kxe6 22. Rxc7 Bd5 Cheparinov,I (2664)-Navara,D (2700) Reykjavik 2012 )15... Nxd4 16. Nxd4 c5 17. Nb5 Rhc8 18. f4 Bc6 19. Nc3 Ke6 20. Kf2 h4 White's opening has failed; Black is better. 21. a4 Kf5 22. Ke3 Re8 23. Nd5?! Rac8 Now White is not well prepared for break moves ...f6 or ...g5. 24. Rd2 f6 25. Rf1 fxe5 26. fxe5+ Kg5 27. Nc3 (Probably MVL was planning 27. Ke4 here, but it is refuted beautifully: 27... Rxe5+!! 28. Kxe5 Re8+ 29. Ne7 Rxe7# )27... Rxe5+ 28. Kf2 Rf8+ 29. Kg1 Rxf1+ 30. Kxf1 Rf5+ 31. Kg1 Rf4 This is a relatively simple, technical win. An excellent start of the playoff for Giri. | Ray Morris-Hill. And so all Giri needed was a draw, and that's what he played for in the second game, it seemed. He chose an unambitious but hyper-solid system against the Grünfeld, and who could blame him? If went fine for the Dutchman, but right when he got a chance to get a real advantage (27.g4) he started to play inaccurately. 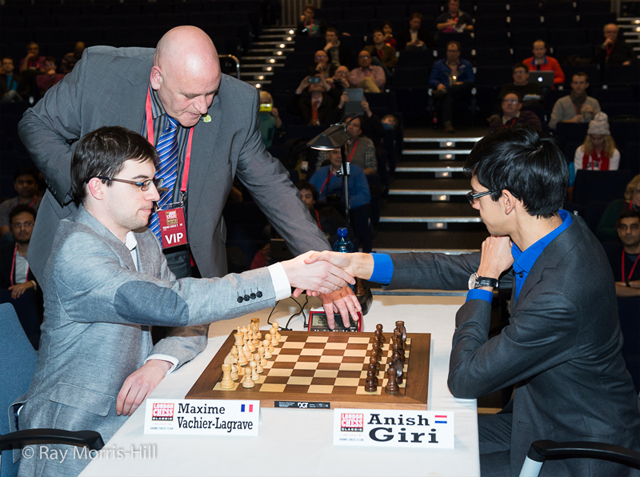 Vachier-Lagrave took over the initiative, and Giri held on for long but eventually he went down after missing a forced draw right at the end. “You can sort of say I made the childish mistake of playing for a draw, blah, blah, blah, but everybody is doing it. It is beyond you,” Giri would later say. A tough blow for Giri, who then lost the toss as well. Vachier-Lagrave chose to play Black in the Armageddon game. Alexander Grischuk, who joined the commentary team for several hours, said he would have done the same. Giri, who is a Grünfeld player himself, decided to avoid it this time with 1.Nf3 but nonetheless Vachier-Lagrave equalized comfortably, then got the advantage and then won because Giri had to avoid a repetition (which MVL played despite having a mate in five on the board!). 1. Nf3 Nf6 2. g3 g6 3. b3 Bg7 4. Bb2 b6 5. Bg2 Bb7 6. O-O O-O 7. c4 c5 8. e3 d6 9. Qe2 (9. Nc3 Ne4 10. d4 Nxc3 11. Bxc3 Be4 12. Rc1 cxd4 13. Nxd4 Bxg2 14. Kxg2 a6 Kramnik,V (2769)-Giri,A (2768) London 2014 )9... Nbd7 10. Rd1 e6 (10... Rc8 11. Nc3 a6 12. Rac1 Ne4 13. d4 Nxc3 14. Bxc3 Be4 15. Bh3 Rc7 Nemeth, Z (2375)-Prohaszka,P (2294) Budapest 2005 )11. Nc3 Qe7 12. d4 Rad8 13. Qc2 d5 14. Ne5 cxd4 15. exd4 Nxe5 16. dxe5 Ng4 17. cxd5 exd5 18. Bxd5 Nxe5 19. Qe4 Bc8 20. Re1 Bf5 21. Qe3 Qc5 22. Rad1 Bg4 23. Rb1 Bf5 24. Be4 Nd3 25. Qxc5 bxc5 26. Bxd3 Rxd3 27. Na4 Rd2 28. Bxg7 Kxg7 29. Rb2 Rfd8 30. Re2 Rd1+ 31. Kg2 c4 32. bxc4 Bd3 33. Re7 Bxc4 34. Re3 R8d6 35. a3? Bf1+ 36. Kf3 Rf6+ 37. Ke4 Re6+ (37... Bg2+ was in fact mate in five, but MVL only needed a draw, saw it and went for it. )38. Kf3 Rf6+ 39. Ke4 Re6+ (39... Bg2+ )40. Kf3 Rf6+ 41. Kg4? Avoiding the draw, but losing the game. “In Bilbao, when I lost the tiebreak to Wesley So, it was fatigue. But here I played well for my own miserable standards. I'm not ashamed of the way I played. “In the final game I thought I'd please Garry Kasparov because it was the way he played when he needed to beat Anatoly Karpov. “Somehow the opening didn't work out but also, to be honest, Black in Armageddon is basically an advantage. It's like you just won a game in a minimatch. This one minute is not so relevant at the end of the day. And also, he is a great blitz player,” added Giri. “It was a pity to lose the tiebreak because I was definitely one of the best players here, if you look at my play. Not otherwise; most players are better. But my play here was very good. I think I should have fought for the first places but unfortunately it didn't work out. Giri scored the most game points of any player in the Grand Chess Tour. | Ray Morris-Hill. 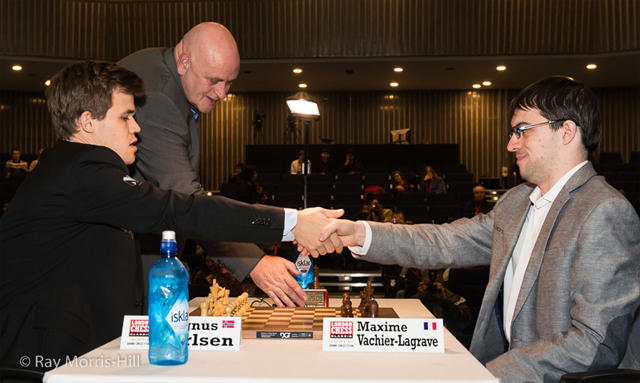 And so the playoff final was between Maxime Vachier-Lagrave and Magnus Carlsen. The funny thing was that if the Frenchman would beat the world champion, the two would finish shared first in the Grand Chess Tour. “It's quite frustrating that this guy Magnus gets so extremely lucky, it's just absurd! I heard that if [MVL] wants to win, he needs to beat [Carlsen] twice. He needs to beat him one match, then they share the Grand Chess Tour Standings, and then he needs to beat him again to win the Grand Chess Tour. But that funny scenario didn't happen: Carlsen immediately won the first game. He was pressing right out of the opening, MVL defended fantastically and reached a theoretically drawn rook endgame, but failed to keep it. The playoff final starts! | Ray Morris-Hill. Vachier-Lagrave had to win as White, but failed to do so. Carlsen chose a rock-solid setup where a loss of a tempo hardly mattered, and in the endgame he even won an exchange. MVL got only a passer on a4 for it, which was not enough. Soon Vachier-Lagrave decided to repeat moves. 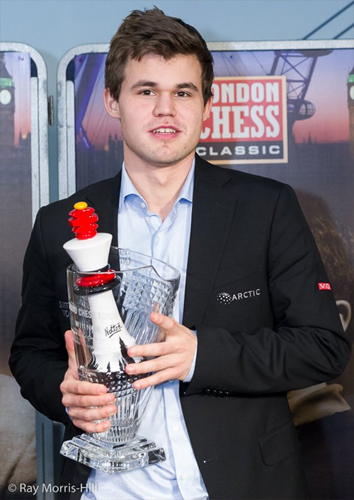 The audience started applauding the winner in London, and the winner of the whole Tour: Magnus Carlsen. Magnus Carlsen does the double. | Photo Ray Morris-Hill. The play-off shall determine the winner of the tournament, the other positions in the crosstable and the distribution of the prize money. The play-off shall determine the winner of the tournament and the distribution of the first prize money. This meant that for the rest of the crosstable (including Giri and Vachier-Lagrave) the final standings were based on Sonneborn-Berger points. The dates for the 2016 Grand Chess Tour are already known: Norway Chess, April 16-29; Sinquefield Cup, August 19-September 2; London Chess Classic November 30-December 13. The organizers have stated that they will try to learn from mistakes and improve the tiebreak system next year.